"My early work is the result of going around that very territory where I lived and not seeing it." At the height of the Great Depression, American Regionalists turned away from European modernism and urban abstraction to embrace subjects of the heartland. These works were figurative and narrative, returning back to an ideal of art-as-storytelling, rendered in precise detail. The American Regionalists celebrated familiar subjects in ways accessible for a general public, making their work popular among a broad range of audiences. Yet, with the rise of totalitarian governments in Europe, who used such realist and figurative art as propaganda, Regionalism came to be seen as politically problematic and retrogressive. It would be soundly rejected in the rise of Abstract Expressionism in the 1940s. The most famous Regionalist painters, Thomas Hart Benton, John Steuart Curry, and Grant Wood, were all associated with specific regions of the American Midwest. This gave their art a local character that suggested its authenticity. They rejected the styles and theories of modern art to embrace techniques and stories that were more connected to an American folk tradition and traditions of Old Master painting. Not all American Regionalism was clearly celebratory. The sincerity of work by Grant Wood, in particular, has been the subject of ongoing debate; some find his depictions of middle America to be reassuring and nostalgic, others see elements of satire and criticism. The work of Curry and Benton is generally more straightforward, although both include darker emotional and moral narratives in their work as well. The sharp rise of American Regionalism, supported in part by the funding of federal agencies such as the WPA, was halted as totalitarian governments employed Socialist Realism as propaganda to support their regimes. Figurative art quickly became tainted by its stylistic similarities. The emergent Abstract Expressionism, which completely rejected Regionalist aesthetics (even though Jackson Pollock was a student of Thomas Hart Benton), would come to represent the American values of freedom and individuality in the 1940s. While certainly some artists, like Andrew Wyeth or Norman Rockwell, continued to work in a figurative and realist style, they were marginalized by the dominance of mid-century abstraction and not considered part of the Regionalist movement. The term American Regionalism refers to a realistic style of painting that began around 1930 and became popular during the Great Depression. Although urban subjects were included, the most popular themes of Regionalism were rural communities and everyday situations. Rather than a deliberate movement, guided by a manifesto or unified agenda, it developed organically through the works of Thomas Hart Benton, Grant Wood, and John Steuart Curry who were dubbed the "Regionalist Triumvirate." Rejecting abstraction, they were responding to a cultural isolationism that saw much of modern art as foreign and out of touch with a true American spirit. These three men dominated the movement; although other artists were briefly associated with Regionalism, most remained limited to their local communities or else passed through to other styles for their mature career. In a full-immersion baptism, the preacher stands in a large wooden stock tank, gripping the shoulder of a young woman dressed in white, ready to lower her into the water. On the left, worshippers stand in attendance, dressed in their Sunday best, as a man reads from a prayer book. On the right appears a group of young people, dressed in white, reverentially waiting their turn to be baptized. The scene compels belief with its realistic details: a motorcar parked on the left, farm dogs on the far right, horse-drawn buggies visible behind the crowd, the red barn with a silo and windmill behind it, and a blue two story farmhouse. Curry's work balances a detailed and straightforward style that seems to report facts with larger metaphorical and allegorical levels of interpretation. The emphasis on observable facts nearly overshadows the symbolic rays of light that frame two birds, one white (evoking the holy spirit believed to descend upon those being baptized) and the other dark (representing the sinfulness washed away by baptism). The New York Times singled the work out for praise when it was exhibited in 1928 at the Corcoran Gallery in Washington, D.C., establishing Curry as a major artist. This metropolitan acclaim runs seemingly counter to the presumed audience for Regionalist painting. Indeed, while his work was thematically and visually associated with his native Kansas, it seldom found favor there as Kansans felt it portrayed them stereotypically as "Bible-thumpers." Instead, Curry's work was most popular among Easterners and New Yorkers who found in it a fresh and sometimes startling view of American life. For these outsiders, its charm rested in the seemingly-truthful capture of an unfamiliar yet nostalgic America. As the artist Harry Wickey wrote, "One is convinced that the story Curry paint[ed] actually happened. It seems to me that this fulfills Walt Whitman's hope and prophecy of a truly great native art growing out of American life." This instantly recognizable painting depicts a dour and aloof couple, the man, his right hand gripping an upright pitchfork, gazes directly at the viewer, while a woman stands beside him, gazing out of the frame. Behind them a farmhouse in the American Gothic Revival style dominates the view. 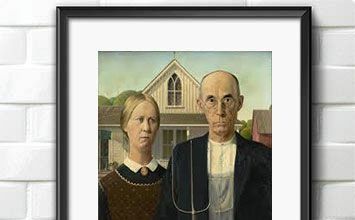 This seemingly straightforward couple, their rigidity echoed in the composition of the painting itself, has been endlessly copied and parodied, making it an icon of American culture. The iconic quality of American Gothic is no mere accident, but represents Wood's interest in timeless traditions of Old Master painting. With a grid-like structure that extends from the three windows of the house (two on the first floor, one on the second story) to the vertical lines of the pitchfork's tines to the lightning rod on the roof, the painting creates an effect of stillness - or stasis. Similarly, Wood integrates the figures with the landscape: the lines of the man's overalls, framed by his black jacket, echo the shape of the pitchfork, and also reiterate the pattern of the house's exterior paneling. Such echoing patterns occur throughout the work, as the pattern of the woman's dress resembles the curtain's pattern in the upper level window, and the shape of the background trees echo the shape of her head. Combining sharply delineated details and realistic portrayal with an ambiguous context, the painting's overall effect was to create an iconic image that as art curator Barbara Haskell wrote in in the 2018 Whitney Museum's exhibition has a "mesmerizing psychological dimension." Despite their frontal stance and the abundance of descriptive details, the figures themselves are difficult to decipher. The models for the couple were the artist's dentist and his younger sister Nan - Wood originally intended the two to be viewed as father and daughter. However, when the work was first shown, most viewers assumed they were husband and wife. There has been debate as to the character of each subject, dissecting body language, facial expressions, and clothing. For example, the unfashionable dress makes it unclear whether Wood is depicting a scene from the past, the thriftiness of a small-town woman or suggesting an old-fashioned and priggish sensibility. The sense of ambiguity evoked by the work has continued to provoke speculation, as art critic Dennis Kardon acknowledged in 2018, "Viewing the painting in person however, one is struck by the incredibly subtle details, cues, and complex formal structure that undermine any simple reading." Shown at the Art Institute of Chicago's 1930 annual exhibition, the painting made Wood instantly famous, although there was debate over whether Wood's portrayal was sincere or ironic. Gertrude Stein, the noted writer and art collector who championed the works of Picasso, Matisse, and other modern European artists, called it, "a devastating satire." Many Midwesterners were initially offended by the retrogressive nature of this portrayal, believing that it created an unfavorable stereotype of small-town people; it was only as the Great Depression wore on that the painting became an iconic depiction of hard-working rural Americans. Woods himself consistently argued that the work was a sincere and celebratory depiction of the Iowa he loved. In contrast to the often-rural subject of Regionalism, this panel from the America Today mural depicts scenes of city life, arranged in a series of collage-like vignettes. Arranged in pairs, Benton suggests thematic and visual comparisons in the three main sections of the panel. In the upper left, burlesque dancers cavort onstage, above a man playing a violin, while in the lower left, a couple passionately embrace. On the upper right, two boxers flail in a ring, watched by an enthusiastic group of men, while in the lower right, we see subway commuters calmly depicted. In the center, a religious revival takes place, as a woman in a pink dress kneels in front of a sign that reads "God is Love," juxtaposed with a couple dancing to live music. Painted in bold colors and rhythmic lines, the scenes bleed into one another, suggesting the flow of city life from one activity to another, while the realistic details convey the diversity of the urban environment. The Art Deco-inspired aluminum molding interrupts and brackets some of the scenes, while also directing the visual rhythm. The overall effect is, as Benton described it, an expression of "the language of the street." The New School for Social Research commissioned the work for its boardroom, and, though he received no fee for his work, Benton rightly felt the project could make his career. As a whole, the mural established the concept of Regionalism, as Benton depicted the nation as a diverse gathering of regions, with eight of its ten panels focused on particular areas, including the Midwest, the West, and the South. Drawing upon sketches from his travels throughout the country in the 1920s, Benton included a wide range of American experience, geography, and history. Spanning from city to country, including both agricultural and industrial labor, Benton also included lowbrow elements of American culture, leisure activities and even bawdy scenes. He claimed that "every detail of every picture is a thing I myself have seen and known. Every head is a real person drawn from life." Painted in the early years of the Great Depression, Benton creates a heroic depiction of labor, with many of his workers recalling the muscular figures of Michelangelo's Sistine Chapel. This idealization of work is complemented by celebratory depictions of modern technology, suggesting that the combination of man and machine will lead to progress and prosperity. The mural was completed on a series of canvases, which has allowed for the sale and relocation of the series. In 1982, the New School sold the murals to the French multinational AXA corporation, who oversaw an extensive restoration project before reinstalling them in its lobby. In 2012, the paintings were donated to the Metropolitan Museum of Art, where they have been installed in a configuration modeled after their original location. Curry creates a dramatic scene of struggle and danger, casting this battle for survival with an unexpected and unsympathetic cast of animals. A number of hogs engage with the rattlesnake, but the victory is uncertain. The snake, caught in one set of jaws, writhes upward as if to strike the reddish-brown hog at the center of the painting. Other animals circle around the periphery of this triad as looming spectators. The landscape is bleak, with only a single tree, its thick twisted trunk rising at a diagonal from the primal encounter. Its low spreading foliage casts a heavy shadow, dividing the composition diagonally and further drawing attention to the struggle. The undulating form and painterly leaves are echoed in Curry's vigorous brushwork that creates both a sense of movement and a tangible fleshiness in the hogs' rippling musculature. Curry based the scene from a childhood memory, a plausible occurrence in the American Midwest where herds of near feral hogs roamed the fields and might encounter a prairie rattlesnake. At the same time, the scene is subtly symbolic. A few red apples hang in the tree's branches, and the single fruit lying on the sunlit ground, along with the serpent and the single tree, evoke the Garden of Eden. We bear witness to a struggle with primordial evil, yet the mood is ominous. There is no image of innocence here and no clear protagonist. The seven hogs are frightening, while the tree shrouds the top of the canvas in darkness and only a thin strip of a cloudy and threatening sky is visible. Of the Regionalists, Curry was best known for his emphasis on dramatic force and emotional expression; in 1941 Grant Wood explained, "It was action he loved most to interpret: the lunge through space, the split second before the kill, the suspended moment before the storm strikes." With its sense of struggle and anti-heroic figures, this work reflected the powerful undercurrents of fear and despair of the Depression era. This painting employs an aerial view to depict the story of Paul Revere, the American patriot, as immortalized in Henry Wadsworth Longfellow's The Midnight Ride of Paul Revere (1863). Revere races along on horseback in the lower left, passing the still-extant steepled church at the Lexington Common in Lexington, Massachusetts. Wood's depiction of Revere's ride to warn of the British army's impending arrival emphasizes the colonial architecture and landscape over the figure of Revere himself. The houses are unnaturally illuminated, as if a theatrical or historical spotlight were being cast upon the scene. The oddly toy-like houses, the geometric clumps of greenery, and the curvilinear road that flows through the canvas give the work a dreamlike quality. That fictive quality extends to the miniature figure of Revere, the legs of his horse splayed illogically in the manner often assumed by pre 20th-century painters. Indeed, Wood borrowed a neighbor's wooden rocking horse to serve as the model, perhaps hinting at this irony. While the sharp detail and painterly realism make the narrative instantly identifiable, it doesn't feel completely factual or accurate; instead, the awkwardness of the painting amplifies the mythical folktale-like nature of Revere's legend. Similar to his Parson Weems' Fable (1939), Wood innovatively combined the highly-finished technique of Northern European Renaissance masters with a simplified and iconic vision of American lore and folk painting. While he celebrates moments of national history, his work is also somewhat ambiguous. Ultimately, the painting remains open to interpretation, either as an accessible representation of a pivotal moment in American culture and history, or as an ironic commentary on the fictionalized accounts of American heroics. Synonymous with the "American Thanksgiving," this painting gathers an extended family around the dinner table, both sides lined with laughing, smiling, conversing faces. Placed around the periphery, these faces draw the viewer's eye upwards, to where the quintessential grandmother, still wearing her impeccable apron, sets a roasted turkey in front of her husband, the pleased patriarch of the family. The table is elegant, but simple, set with the family's best china and silverware, but without ornate details or evidence of elitist tastes. The simple virtues of family life are made visible, as is the promise of prosperity and good fortune. As art historian Stephanie Plunkett wrote, "Rockwell considered himself to be a visual storyteller...his greatest strength was his ability to enter the American psyche. People responded to his art because they saw the best of themselves in it." At the time it was painted, this ideal was being championed as part of the wartime efforts surrounding World War II. As families were asked to ration food and young men were sent to fight overseas, Rockwell's vision was powerfully nostalgic and propagandistic. This was intentional: this work, along with Freedom of Speech, Freedom of Worship, Freedom from Fear, was part of a series that visually expressed President Franklin D. Roosevelt's Four Freedoms: State of the Union Address from January 1941. Transformed into prints, the images appeared in four consecutive issues in 1943 in The Saturday Evening Post and became widely popular. They were featured in a successful exhibition tour, sponsored by the Post, used by the U.S. Department of the Treasury to sell war bonds. Displayed in schools, post offices, and other public buildings, the series sold four million posters by the end of World War II. Its popularity has endured, as 25 million copies of the prints were sold by the end of the 20th century. Rockwell blurred the lines between Regionalist painting and illustration, creating paintings that reached a mass audience through reproduction. This allowed him to reach a far greater audience, his works were owned by many different socio-economic groups. Indeed, among his most prominent collectors are Steven Spielberg and George Lucas, whose films were influenced by the artist's ability "to distill a narrative into a single frame."